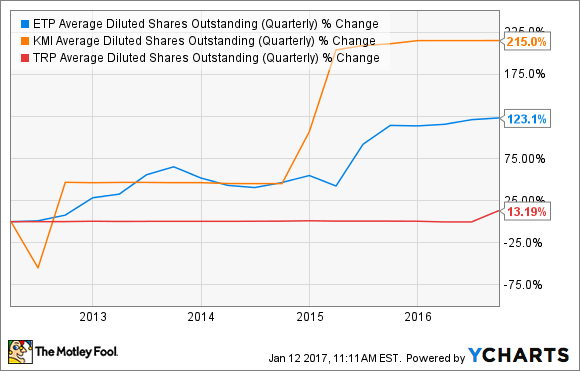 Will TransCanada Corporation Raise Its Dividend in 2017? The Canadian oil pipeline giant has already signaled that its dividend will rise in 2017, which it backs up with strong financials and a visible growth backlog. TransCanada (NYSE:TRP) is a dividend champion in the energy sector. Not only has it increased the payout for the past 16 years, but it has delivered 7% compound annual dividend growth during that period. However, its best dividend growth days appear to lie ahead. Backed by a portfolio of primarily fee-based assets, a conservative financial strategy, and a burgeoning backlog of highly economic projects, TransCanada should have no problem increasing its payout not just in 2017 but for the next several years. Underpinning TransCanada's ability to pay a steadily growing dividend is its portfolio of stable assets. Currently, 92% of the company's adjusted EBITDA comes from regulated and long-term contracted assets, which supply it with consistent cash flow. Furthermore, the company is in the process of pushing that number to 95% by selling its merchant power business in the U.S.
TransCanada's conservative financial approach is another driver behind the sustainability of its payout growth. Unlike many U.S. rivals, TransCanada reinvests a substantial portion of its cash flow into new projects instead of doling out nearly all of its available cash to investors via dividends. For example, since 2010, the company has placed 20 billion Canadian dollars of new assets into service, while only financing CA$10 billion of the growth. The other half of the necessary capital came from internally generated cash flow, enabling TransCanada to keep its share count relatively unchanged. ETP Average Diluted Shares Outstanding (Quarterly) data by YCharts. In fact, the only reason TransCanada's share count bumped up recently was because it sold stock to help finance the acquisition of Columbia Pipeline Group. Meanwhile, the decisions to pay dividends at maximum cash flow capacity came back to burn both Kinder Morgan and Energy Transfer Partners, which needed to slash their payouts in recent years to internally finance growth projects and repair bloated balance sheets after the markets stopped handing them cheap capital. TransCanada, however, hasn't had to worry about access to capital because it boasts an A rating from credit rating agencies, while both Energy Transfer and Kinder Morgan are right at the bottom of the investment-grade cutoff. TransCanada intends to continue pouring a significant portion of its stable cash flow into new growth projects. As of the end of last quarter, the company had CA$25.4 billion of visible capital investments lined up through 2020. Several of these projects are expected to enter service this year, including natural gas pipelines in Mexico, Canada, and the U.S. and two oil pipeline projects in Canada. This backlog supports TransCanada's view that it can increase the dividend by 8% to 10% annually through 2020. In fact, last year's acquisition of Columbia Pipeline Group not only boosted near-term cash flow but added a slew of high-return growth projects that now has TransCanada expecting dividend growth to be at the upper end of that range. Needless to say, with its steady cash flow, conservative payout ratio, strong balance sheet, and visible growth from new projects entering service, it is a virtual lock that TransCanada will increase the payout this year. TransCanada has a long history of steady dividend increases, which have averaged 7% over the past 15 years. However, the company has entered into an accelerated growth phase, which should see it grow the payout even faster during the next several years. That means that investors can pretty much bank on a nearly double-digit increase in 2017.